With the schools having gone back, the weather notoriously warm and the surf having returned to our shores, September is a fabulous time to visit Cornwall. To make sure you get the most out of your stay, we’ve compiled a list of the best happenings around the county over the late summer month. Head to the North Woods on St Micheal’s Mount to the wonderful Emma Gunn, a wild food expert, and really get back to nature. Learn what’s good to eat along the coast path and in the woods, before enjoying a delicious picnic prepared by St Micheal’s Mount’s head chef, Greg Milne. Get your ticket before they sell out! Bring your flags and whistles and be part of a real party atmosphere at this world famous theatre in the cliffs in West Cornwall. 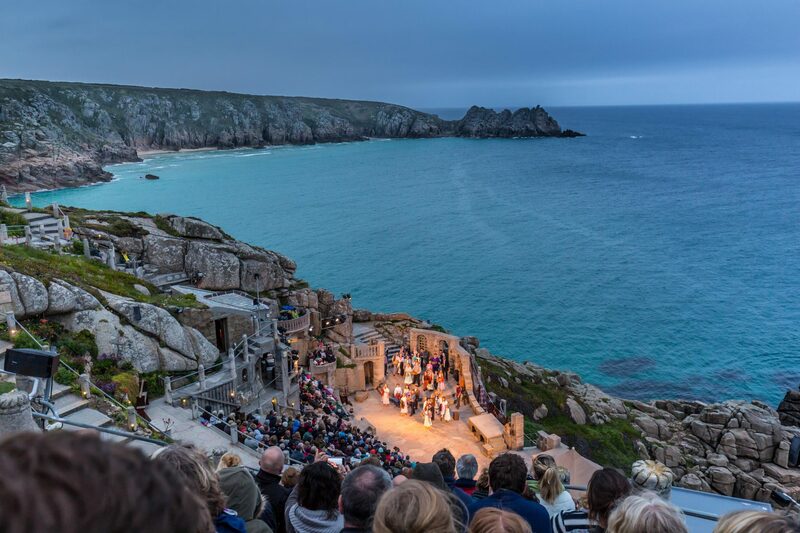 The Minack theatre will play host the Mount Charles Band amongst others at the end of the month, for an evening of beautiful music, amazing scenery and excellent atmosphere marking the end of the Minack’s season. Tickets on sale now. September sees St. Ives welcome the return of its two-week festival, celebrating music and the arts all over the town with open studios, live music, guided walks, free exhibitions and more. There’s plenty for everyone, and all within the beautiful backdrop of this quintessential Cornish town. Find out more about what’s on on the website. Award-winning theatre company Kneehigh are back with their summer residency, The Asylum. Located in the magical Lost Garden’s of Heligan, during September they are bringing their audiences FUP: A Modern Fable. With humour, heart and a heavy dose of talent, if it’s in accordance with Kneehigh’s track record, this play will be a huge hit. Read more about the show and book tickets on the Kneehigh site. This home-grown festival features local musical (and brewing!) talent based at one of the biggest cider farms in the county, Healey’s. With headline acts such as The Fratellis and The Wurzels, if you can picture yourself enjoying great music on a hay bale with a pint of cold local cider in hand, make sure you visit this festival – day tickets are available.There’s something for everyone this September, and with plenty of properties ideally located to visit all of these events, you’re in for a smashing September stay!